ManageEngine Password Manager Pro (PMP) is a Password Management Solution for enterprises to control the access to shared administrative⁄privileged passwords of any enterprise resource. Store & organize all your privileged identities in a centralized vault. Securely share administrative passwords with the members of your team on need basis. Automatically reset the passwords of servers, databases, network devices and other resources. Control access to IT resources and applications based on roles and job responsibilities. Launch direct connection to remote IT resources, websites and applications. Video record & audit all privileged access, get complete record of all actions. The IT divisions of some of the World's largest organizations and Fortune 500 companies rely on Password Manager Pro to control access to their IT infrastructure. 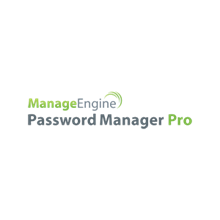 Over 300,000 IT admins and end users log in to Password Manager Pro on a typical day and manage millions of privileged passwords. Store all your enterprise passwords - privileged accounts, shared accounts, firecall accounts and others in the secure, centralized repository. Securely manage shared accounts such as 'Administrator' on Windows, 'root' on Unix/Linux, 'enable' on Cisco, 'sa' on SQL and others. Request-release controls for password retrieval. Provision for granting time-limited access, exclusive privilege and concurrency controls. Well-defined ownership for the passwords stored in the centralized vault. Provision for selective sharing of passwords on need basis. Import users / user groups from Windows Active Directory or LDAP and also leverage the authentication mechanism. Fine-grained restrictions on managing resources and passwords stored in PMP. Restrictions are enforced based on predefined user roles. Reset the passwords of remote resources from Password Manager Pro web-interface as and when required or automatically through scheduled tasks. Ensure usage of strong passwords and periodic resets by creating and enforcing your password policy. Supports out-of-the-box a wide range of target systems, databases, network devices for access control and automatic password resets. Any application or script can query PMP and retrieve passwords to connect with other applications or databases, eliminating hard-coded passwords. Automatically identify and reset the passwords of service accounts associated with domain accounts. Option to automatically execute custom scripts to carry out any follow-up action after a password reset action. Users can launch highly secure, reliable and completely emulated Windows RDP, SSH and Telnet sessions from browser without any plug-in or agent software. Privileged sessions launched from PMP can be completely video recorded, archived and played back for forensic audits. Automatically log on to the target systems, websites and applications directly from the PMP web interface without copying and pasting of passwords. Complete record of 'who', 'what' and 'when' of password access. Intuitive reports on entire password management scenario in your enterprise. Reports on the violations with respect to the use and management of privileged passwords based on the requirements of PCI-DSS. All passwords & sensitive data are encrypted using AES 256-bit encryption. Dual encryption for extra security. Can be configured to run in FIPS 140-2 compliant mode. Enforcing two successive stages of authentication for logging in to PMP. Usual authentication is the first stage. Various options provided for the second stage. Retrieve passwords and approve requests on the go. Provision for secure offline access. Provision for both scheduled and live backup of entire database for disaster recovery. Uninterrupted access to enterprise passwords through the deployment of redundant server and database instances. (A single Premium or Enterprise Edition license is enough for High Availability). Retrieve passwords even when there is no internet connectivity. The offline copy is as secure as the online version. Offline access is available in mobile app too. What Platforms Does Password Manager Pro Support? What Problems Does Password Manager Pro Solve? Are you drowning in a pile of privileged passwords? Do you store administrative passwords in spreadsheets & flat files? Do you find it difficult to track who has access to which accounts? Do you laboriously logon to each application separately to periodically change passwords? If yes, you certainly need Password Manager Pro! Administrative/Privileged passwords are literally aplenty in enterprises. Servers, databases, switches, routers, firewalls and any other hardware or software, could have equally large number of administrative passwords. These passwords are insecurely stored in spreadsheets, text files and even as printouts and are shared by a group of administrators. Password Manager pro solves all these problems by providing a secure system to store, administer, and share passwords. What are the Licensing Options for Password Manager Pro? Evaluation download valid for 30 days capable of supporting a maximum of 2 administrators. You can test Enterprise edition features. Free Edition licensed software allows you to have 1 administrator and manage up to 10 resources. Valid forever. Password Manager Pro comes with four user roles - Administrator, Password Administrator, Password User & Password Auditor. The term 'administrator' denotes both Administrators & Password Administrators. So, licensing restricts the number of Administrators AND Password Administrators. There is no restriction on the number of Password Users and Password Auditors. To get more details on the four user roles, refer this section of our help documentation.